You don't need anything flashy for your outgoing mail. What you really want is a simple solution that lets you complete the often annoying chore of preparing outgoing mail. 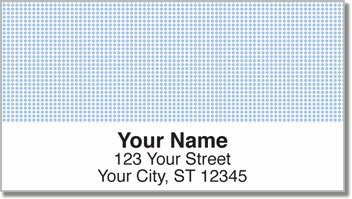 This minimilastic return address label design features a precise pattern of tiny points in four color choices. It's the perfect compromise of style and simplicity. You'll be saving time and effort when all you have to do is peel and place a self-adhesive label on each envelope. Plus, you can also use this product to mark all sorts of personal property as your own. Order Basic Dot Address Labels from CheckAdvantage today! If you're only interested in one color choice, single designs are available for both labels and checks.